Ground has been broken on a new ‘smart mall’ concept in Dubai’s Jebel Ali district. The new retail complex, which spans some 78,500 square metres, is part of phase 1 of the Wasl Gate mixed-use development. 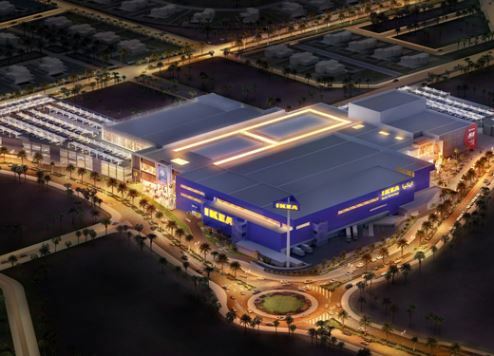 Located close to the Energy Metro Station and a few hundred metres from the existing Ibn Battuta Mall, the new facility will house a 30,000-square metre Ikea store (the fourth in the UAE), a 4,000-square metre Ace hardware store, as well as 100 retail outlets. The total leasable space will be 55,000 square metres, with parking for more than 2,000 cars. The mall is slated to open in the first quarter of 2019. “The smart mall is part of a Greenfield mixed-use project and will be a landmark destination,” said Omar Al Futtaim, vice chairman of Al-Futtaim, the developer behind the project. The second phase of Wasl Gate will comprise residential units, a sports complex, K-12 schools with international curriculums, and a central park connecting the community’s commercial and residential zones. Christopher Wentzel, head of development, Wasl Asset Management Group, said the development would also include space for start-ups and small- to medium-enterprises. The masterplan also includes road improvements and infrastructure upgrades in Jebel Ali, a busy area next to the port in ‘New Dubai’.